In this issue: GLEAM takes over Olbrich Botanical Gardens, a new ancestor appears in the human family tree, and three Wisconsin poets net NEA Creative Writing Fellowships. Features include: exploring butterflies, plants, and our pharmacological future; remaking our food systems; saving our heirloom apple heritage; talking to your uncle about climate change; feeling the modern dance movement; and celebrating 75 years of rural arts. New fiction, poems, poems, and more poems from our 2015 contests. When the winds of change are in the air, it’s a good idea to gather one’s extended circle—especially the wisdom-keepers and those who understand our history and how it shapes these times and the future. Humans have descended from an evolutionary branch that includes divergent species such as Australopithecus africanus, which lived around 3 million years ago, and Homo erectus, which lived around 1.5 million years ago. Zoologist and Academy Fellow Allen M. Young reveals the delicate evolutionary dance between tropical butterflies and plants. The Wisconsin Regional Art Program (WRAP) has been changing the lives of Wisconsinites both rural and urban since 1940. Over soup lunch in Hackberry’s Restaurant, upstairs from the bustling La Crosse food cooperative, Ellen Moore darts her vibrant eyes from one loving student to another. 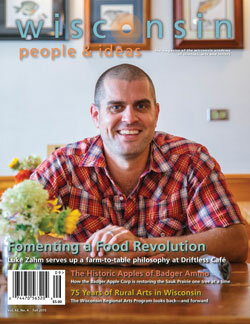 Luke Zahm is fomenting a food revolution at Driftless Cafe in Viroqua. When the children drew pictures of our school, it always looked as if they were drawing a jail. They would start with a big rectangle, and then fill it with countless little squares until the windows started to overlap. One of the charms of visiting the North Woods of Wisconsin is stumbling upon the occasional quirky attraction. Turn down a side road, and you might discover a park full of concrete-based sculpture or a wooden Muskie the size of a semi. Few contemporary writers are able to capture the essence of small-town Wisconsin as meticulously or as relentlessly as Michael Perry.